South Korea has held military exercises using live artillery fire on Yeonpyeong island, weeks after the North shelled the island following a similar drill. Pyongyang labelled the latest exercise "reckless military provocation" but said it would not retaliate. Intense diplomacy over the weekend ended with the UN Security Council failing to reach an agreement. After the drills, China urged both sides to avoid armed confrontation. "Whatever the differences and disputes relevant parties may have, they can only be addressed through dialogue and negotiation rather than by conflict or war," said foreign ministry official Cui Tiankai. Russia also renewed its calls for both sides to show restraint. Earlier, the US envoy to the UN, Susan Rice, said the drills were "fully consistent with South Korea's legal right to self defence". The South's government has been under huge domestic pressure to take a tough stance towards Pyongyang, in the wake of the 23 November shelling by the North. Yeonpyeong residents were told to move into air-raid shelters early on Monday - part of regular procedure during military exercises in the area. South Korea's defence ministry said the drills began at 1430 (0530 GMT), after being delayed by thick fog, and ended 90 minutes later. 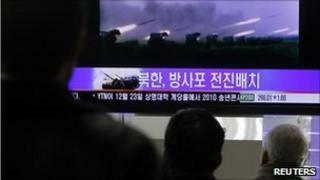 Southern officials have insisted that the artillery guns on Yeonpyeong were aimed south-west, away from North Korea. But the North claimed any ammunition fired would inevitably land in its territorial waters, and warned of an "unpredictable self-defensive blow". For its part, South Korea said it would "immediately and sternly" deal with any North Korean response, according to an officer at the Joint Chiefs of Staff (JCS). The island is close to the two countries' disputed sea border, the Northern Limit Line, and within view of the North Korean mainland. Meanwhile, veteran US politician Bill Richardson is in North Korea on an unofficial visit, attempting to ease tensions. Mr Richardson, governor of New Mexico, told CNN that he had held "very tough" talks with Maj Gen Pak Rim-su, who leads North Korean forces along the border with the South. He said he was confident progress had been made. CNN reported that northern officials told Mr Richardson they would allow UN nuclear inspectors back into the country, but there has been no official comment. The BBC's Jane O'Brien in Washington says the US is in a tough spot, as there are 28,000 American troops stationed in the South, and they would almost certainly be drawn in if hostilities erupt. The US is walking a diplomatic tightrope, trying to avoid that unfavourable option while remaining a strong ally to the South, our correspondent adds. The island is normally home to some 1,300 residents along with hundreds of marines, but most civilians have fled to the mainland, leaving only about 100 remaining, Yonhap said.